There are so many paths in this world, so many opportunities and experiences we can have. Some of us get lost trying to find the right path. I tried to travel down the wrong path and it led me to nothing but regret, guilt and sadness. 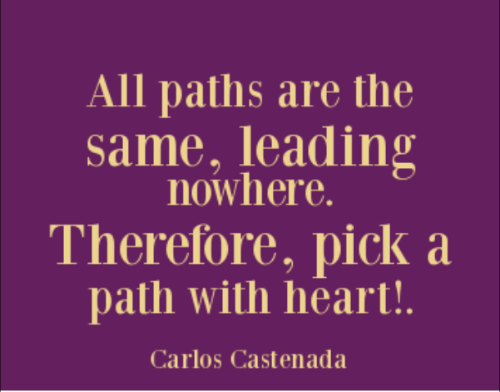 I have tested out different paths since then, trying to find the one that will lead me back to where happiness lies. Most of them were dead ends. My intentions were right but my directions were wrong. The road I am traveling on now may or may not be the right one. There’s no way for me to be sure. I know what I want and what will make me happy, I just have to be patient and hope that those things are up ahead on this road. I can’t help but feel like I am always going to be traveling down a road to nowhere. I am living in my past and cannot let go of what happened. My mistakes haunt me and hold me back from moving forward. I have achieved a lot over the past couple of years. My success with my education have been amazing and things are great on the work front. I have built better friendships and ended those that weren’t good for me. It’s what goes on in the inside that makes things difficult for me. No matter how well my life is going in every other aspect, when it comes to my relationship with myself I struggle. I cannot forgive myself for the past. I don’t think I will every be able to unless I know that Matthew forgives me. I don’t care how long it takes or how hard it will be but I will earn his forgiveness some way somehow. I know I am holding myself back from other opportunities. I know that there are other people out there I could be with but I cannot love them. Thats not fair to them or me. I compare everyone to him, down to every detail. If by chance I were to meet someone that is almost just like him, it still wouldn’t work. I would be with that person only because they are like matt, not because of who they are. That is not right. So here I am traveling down this road which may or may not lead me to happiness. But I am following my heart and to me that feels right. I know what I want to be at the other end but is it there? Today was rough. I didn’t have to work so I was at home in bed all day….alone….with my thoughts. The day got better when my cousin Sean picked me up and we went to dinner. I needed to get out of the house and it’s always nice spending time with him. He always makes me laugh. I got to watch a couple of my favorite shows this evening so I guess it wasn’t such a bad day overall. I just hate being trapped in the house alone and not being able to go anywhere. I’m so tired of the snow. I’m ready for spring. Then I can sit outside and enjoy the outdoors instead of being stuck in the house. This week is going to be difficult. My mother and I both lost our best friends during this week….Sarah 3 years ago and Sheila last year. I need to make sure to spend a lot of time with my mom this week to help her through it. And as usual I must bring up Matthew. I still don’t know what to do now that he has read my letter. I guess the only thing I can do is wait. I’m just scared that if I wait too long without doing anything that there will be no hope left. And then i’ll beat myself up for not doing anything when I had the chance. What if I never see or talk to him again? I won’t be okay with that. The pain of being without him is already so intense. What if I have to feel this for the rest of my life? I just want to be in his life in some way. He’s a part of me and I can’t go on forever without that part. I need it. I need him. All I could think about over the past week is whether or not Matt had received my letter and if he read it. I needed to know. I finally asked Adam to see if he could find out for me. To my surprise he had already asked him. He did read it along with this blog. I was not expecting to hear that. I was hoping he would take the time to read the letter but I never thought he would read my posts too. I don’t know how many of them he read or if it affected him in any way. It could’ve just been nothing more than curiousity, but i’m hoping not. My mood instantly changed after finding that out. Nothing could’ve ruined my day after that. The thing that got to me the most over the past year is that he didn’t know how I feel or where I stand. Now he does. The letter may change nothing for us but at least he now knows how much I still care for him. That’s all I wanted. I’m not expecting anything more right now. But I am still holding onto the hope that we will be together again in the future no matter how far away that may be. The feelings I get when I think of him are so overwhelming. These feelings are always accompanied with sadness and tears but now I can smile through the tears knowing that he read what I wrote to him. At least now I have been able to express my feelings. All I can do now is wait and pray. I cannot and will not give up. Yesterday I sent my letter to Matt. I was so nervous about it. I put it in the mail basket at work in the mornin. I happened to be standing up front when the mail man came in. I watched him pick it up and walk out and I started wishing I could get it back. I still keep wondering if I left something out or if I could’ve made it better somehow. But most of all I just hope he reads it. There’s no way for me to know whether or not he does. But I really need him to know how I feel even if it doesn’t change anything. he either received it today or will tomorrow. I’m so nervous.